Beckie’s resume literally exhausts me. How one girl can take on so much is beyond me, but I’m so thankful that we get to benefit from it! Of course, all that work means that she’s quite the savvy blogger. She knows all the ins and outs of…well…everything! I could sit down with her for hours to pick her brain, but here’s just a sampling of what she knows! Hey JaG readers, this is Beckie from Infarrantly Creative, Knock off Décor and Roadkill Rescue. Yes I know…I am crazy. 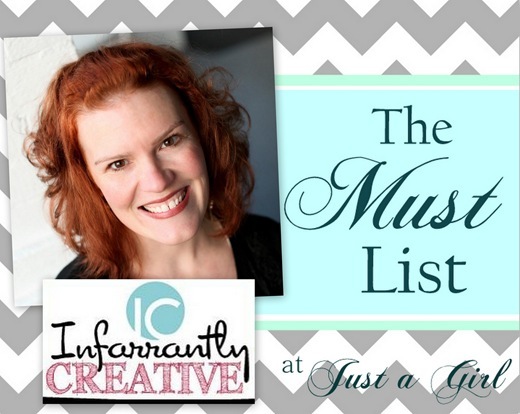 Chris asked me to talk about my must haves for blogging. I am kind of a gadget girl and I am into anything that will make my life or blogging easier. So here are my “I can’t live without” tips to making blogging easier. 1. Windows Live Writer I do all of my blog writing in Windows Live Writer (sorry Mac users, this isn’t available for you, boo!). It is a software program that you sync your blog to and you do all the writing of your posts in that program. It is wonderful because you don’t have to be connected to the internet to write a post. You also don’t need to upload your pictures – you just drag them where you want them in your post in Windows Live Writer. If you post in blogger or WordPress – this little nugget will change your life. Your welcome. 2. 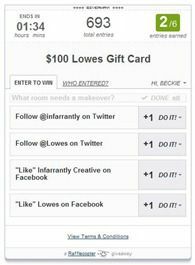 Rafflecopter I run about 4-6 giveaways and month and Rafflecopter has made it so much easier to keep track of. You login to Rafflecopter and set your giveaway up and then they give you code that you then add to your giveaway post. All of the entries are stored on Rafflecopter so they don’t clog up your comment section. You also can announce the winner onto the widget when the giveaway has ended and you email the winner from the site as well. This is what the widget looks like on your post. 3. 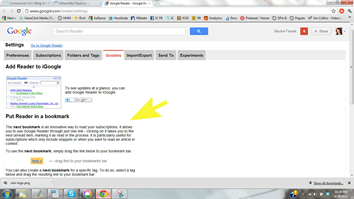 Google Next Bookmarklet Do you read blogs via Google Reader? You can install the Google Next Bookmarklet into your browser and then you just click a button to see the next blog. You can find the “Next” bookmarklet on the Settings page under the Goodies tab. Google says ”The next bookmark is an innovative way to read your subscriptions. It allows you to use Google Reader through just one link – clicking on it takes you to the next unread item, marking it as read in the process. It is particularly useful for subscriptions which only include snippets or when you want to read an article in context.” Plus it helps give your favorite bloggers pageviews, which is a nice way of saying thank you. This is what it looks like in your browser (mine is Google Chrome). 4. My Blog Planner I have to give a shameless plug for my blog planner. It took me hours upon hours to design a planner that would work well for the creative blogger. 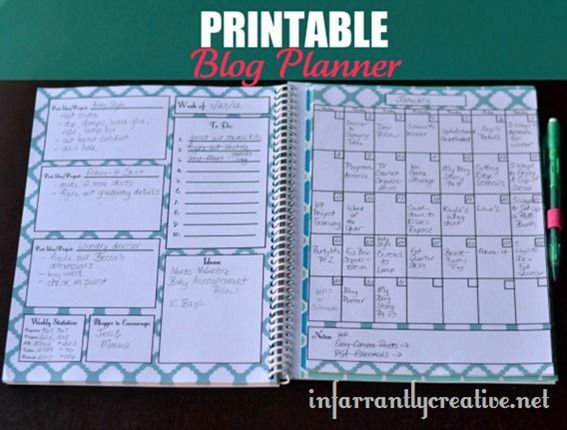 This planner allows me to stay on top of guest posts, project ideas and giveaways. Plus I offer it as a free printable for you right here. 5. Mom Blog SEO by Kelby Carr. This e-book is amazing if you want to take your blog to the next level. You work on it for 30 days and Kelby teaches you how to write blog posts to attract more readers and allow Google to crawl your page better. This boosted my traffic about 20% after the first month of implementing her strategies. SEO confuses the junk out of me but this certainly took the guess work out of it. Thanks for allowing me to share my blogging “must haves”. I hope you will pop on by and pay a visit. Wow! Beckie if freakin awesome! Such great tips- and not just the usual stuff you see about blogging better. I bet she could write a book on this topic! I just love Beckie to pieces and this just adds 1 more reason I do! Thanks for letting her share some of these great tips with the rest of us! Great tips! That reminds me, I need to download that calendar…….and I used to do everything in Live Writer too! Loved it. What a great list! Thanks for sharing it! LiveWriter sounds absolutely amazing…now I’m bummed that we just switched over to Mac!! I have gotten so behind on my blogging (mainly family scrapbook/journal) primarily because loading & arranging the pictures takes SO long 🙁 And I use a LOT of pics since my blog is pretty much our family scrapbook. Beckie always has such great info! Thanks! Wonderful list! I wonder if LiveWriter works with Linux? I’ll have to check with my techy hubby since he’s the one that loves Linux sooooo much. Oh and I’m definitely going to check out the ebook! Beckie knows what she is talking about. Those are wonderful. 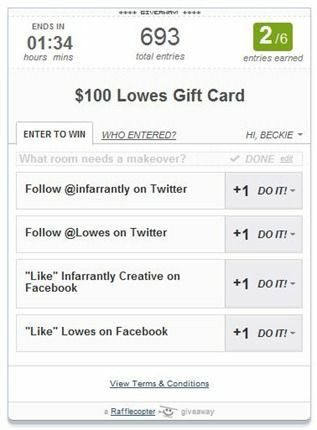 I need to figure out Rafflecopter. I already loved Beckie, but WOW, this just rocked my bloggy socks off. That Google Reader Bookmarklet is the solution to one of my biggest blog reading pet peeves….thank you!!! what a great post! i didn’t know about live writer and just “discovered” it on my new Vaio. LOVE!! thanks for sharing your wisdom! I need to download that calendar! Great tips! Just saw this post, I’m on it!